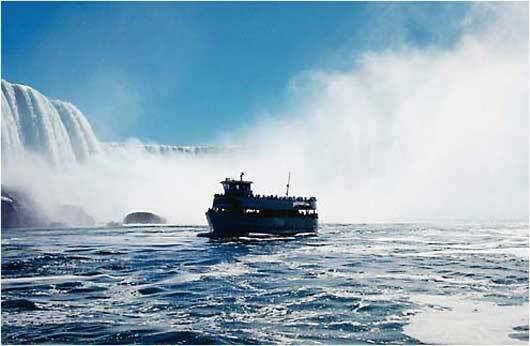 Visitors to Niagara Falls are familiar with the Main-of-the-Mist, a small excursion vessel that carries passengers on daring up-close trips to the foot of the falls and back down stream. It always appears to be in view, and many have enjoyed boarding the vessel and taking the ride. There are two Maid-of-the-Mists making the trip these days. They are Maid’s V and VI, two relatively modern steel boats with powerful diesel engines. But the history of small excursion vessels bearing that name dates back to 1846 when the first Maid-of-the-Mist was launched as a ferry, carrying people to and from the U.S. and Canadian sides of the Niagara River. Two years later, when the Rainbow Suspension Bridge was completed, the ferry service shifted into what is now the excursion service for tourists. That first boat was a two-stack steamboat powered by sidewheel paddles. It operated successfully for eight years before it was joined by a larger and more luxurious 72-foot-long steamboat. Maid-of-the-Mist I looked a lot like the first boat, with two smoke stacks and paddle wheels on the sides.